The reaction to the tragedy has been very moving. The cricket world has expressed heartfelt sympathy for Phillip, his friends and family. But it has also embraced Sean Abbott, who bowled the ball that struck Hughes, recognising the effect the incident will have had on him. Soon after the world learned that Phillip had passed away, a Sydney IT worker called Paul Taylor started a simple tribute called #putoutyourbats. 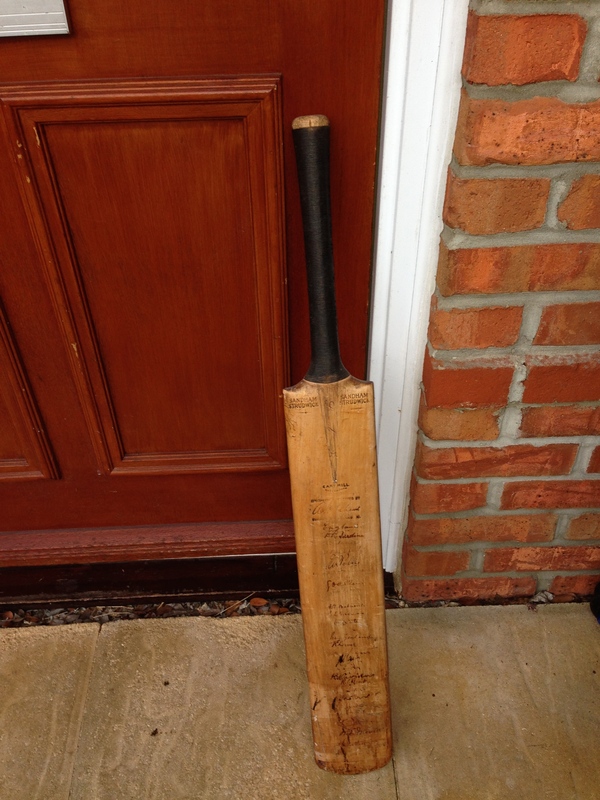 He tweeted a photo of a cricket bat leaning against the porch of his home. Thousands followed his example. My photo appears at the top of this post. The bat in my photo has an interesting history. It is my father Bob Skinner’s old bat, and was a generous gift from his father in the 1930s. It features the signatures of the England and touring New Zealand cricket teams. Back in 1998 we dated it using the internet – an early example of the power of the web – by comparing the names of the bat and the teams from New Zealand tours in the thirties featured in online articles. Dad used the bat a lot, which explains why it shows signs of wear (not to mention binding, which we later removed). Back in the 1930s, few people could afford to keep a bat for decoration. We never think of cricket as a dangerous sport, especially since the advent of the helmet in the 1980s. Football – soccer – has also seen freak accidents: growing up in the 1970s, I was shocked to read about the 1931 death of Celtic goalkeeper John Thomson in an Old Firm match. Thomson’s head collided with the knee of Rangers striker Sam English and died later that evening in hospital. Rest in peace, Phillip Hughes. This entry was posted in Social media, Sport and tagged #putoutyourbats, Philip Hughes by Rob Skinner. Bookmark the permalink. I enjoyed that. Perhaps someone will offer you a few thousand fr the bat!